Playing-card History: Who are the court figures? Who are the court figures? Who are the court figures? This is a common question about the most widespread playing cards. 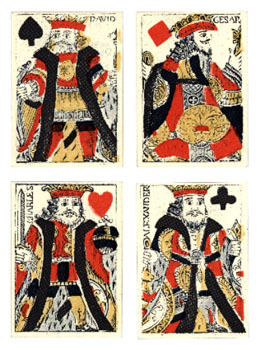 Their general type—with Kings, Queens and Jacks presiding over suits of Hearts, Clubs, Diamonds, Spades—originated in France c. 1450–1470. The French have been inclined to identify their court cards as specific persons. These vary greatly according to time and place, and much confusion has been introduced by ill informed and illiterate copyists. Here the subject will be limited to two standard French patterns: that from Paris and one of the patterns from Rouen. This Rouennais pattern probably originated in the 1400s. Examples are known from the 1500s. It died out in France but was exported to England and became the direct ancestor of cards there and susequently in America. The pattern is therefore called "Anglo-American." It supplies no names for its court cards.